Configure IP access rules to allow or deny access for the entire server. 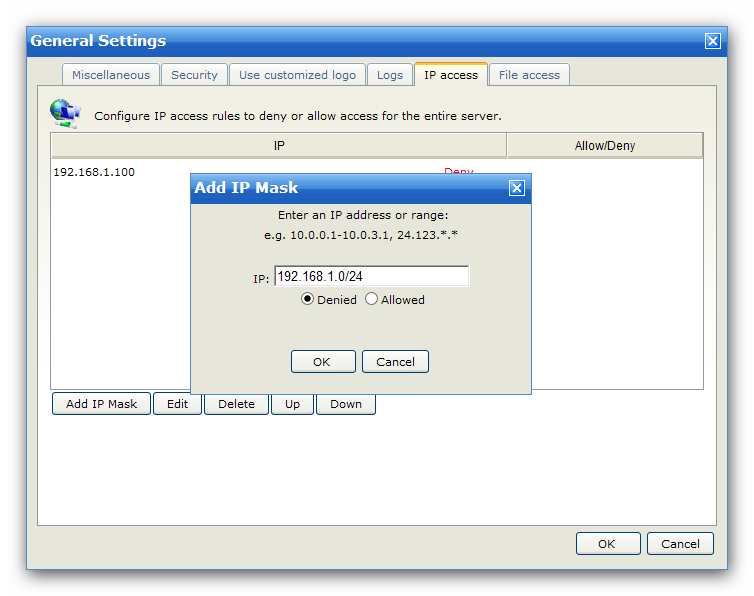 You can define IP access rules to allow/deny users' access based on IP address for the entire server. If you do not specify an IP address, the administrators can logon the server with any IP address. But if you set an allow list, the administrators can only obtain access by IP addresses specified in the list. If you set a deny list, the administrators can have access to the server by any IP address except those specified in the deny list. Refuse all users' connection from any IP except 127.0.0.1. Refuse all users' connection from any IP, since 127.0.0.1 after * impacts nothing. The server's IP Access list has priority over domain's IP Access list.